The Ladybird birthday cupcake cake includes a gorgeous ladybird shaped main cake with 40 cupcakes decorated with blue boston cream icing and a rainbow, or white boston cream icing and a ladybird. 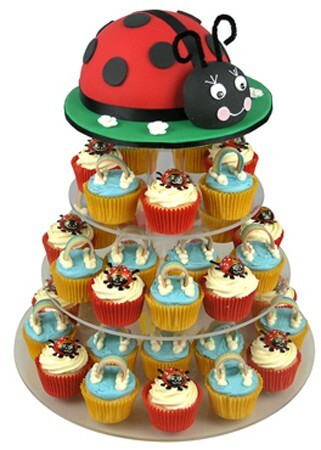 This adorable cupcake tower comes with a gorgeous ladybird shaped main cake, complete with a very cute and smiley face. 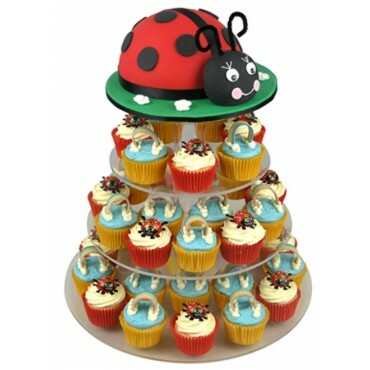 Complete with 40 cupcakes (available in Vanilla & Chocolate flavours) alternatively decorated with blue boston cream icing and a rainbow, or white boston cream icing and a ladybird.